Hundreds of youth joined Hines Ward, member of the President’s Commission on Asian Americans and Pacific Islanders and receiver for the NFL’s Pittsburgh Steelers, along with fellow NFL players Troy Polamalu, safety for the Pittsburgh Steelers and Marcus McNeill, offensive tackle for the San Diego Chargers, to stress the importance of physical exercise and nutritious meals at a health and fitness fair Saturday, April 2 at the University of California, Los Angeles’s intramural field. The event sponsored by The White House Initiative on Asian Americans and Pacific Islanders addressed the soaring obesity and diabetes rates among high school youth, particularly within Native Hawaiian and Pacific Islander communities and in the nation’s Pacific region. Native Hawaiian and Pacific Islander (NHPI) children have the highest rates of any minority group for being overweight or obese and hold an elevated risk for developing cardiovascular disease and Type 2 diabetes. Sefa Aina, vice chair of the President’s Advisory Commission, spoke of how native food once grown and eaten by Polynesians have since been replaced on the Pacific Islands by imported products. A reliance on cheap, fast food in the continental United States also has contributed to unhealthy eating. He said the message must also come from parents, schools, community leaders and elected officials in order to be effective. Commissioner Hines Ward said, as a professional athlete, he always wants to achieve his best for his teammates every time he steps onto the field. He emphasized that diet and exercise are a critical part of his regimen. In February 2010, President Obama issued a statement recognizing that Native Hawaiians are a vital part of the nation’s cultural fabric. He supported the Substitute Amendment to H.R. 2314, the Native Hawaiian Government Reorganization Act of 2009, legislation crafted to formally extend a federal policy of self‐governance and self‐determination to Native Hawaiians achieving parity in U.S. treatment of its indigenous peoples – American Indians and Alaska Natives. 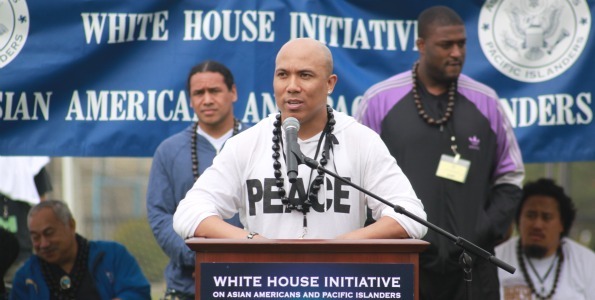 The White House Initiative on Asian Americans and Pacific Islanders is conducting outreach efforts to include all Pacific Islander Americans including Native Hawaiians, Chamoru, Samoan, Tongan, Fijian, Marshallese, Palauan, Pohnpeian, Chuukese, Yapese, Kosraen and others from the Micronesian, Melanesian and Polynesian Pacific Islander groupings.